ALBANY, NY (WSKG) – Governor Cuomo spoke publicly for the first time since his former closest aide was convicted of running two bribery schemes while working for the governor and managing Cuomo’s reelection campaign. Cuomo says he respects the jury’s decision, but feels personally sad over the conviction of Joe Percoco, a man he has referred to as his “brother”. “He has two young daughters who are going to have to live with this trauma,” Cuomo said, during questions form reporters at an unrelated event in New York City. But the governor says Percoco acted on his own. 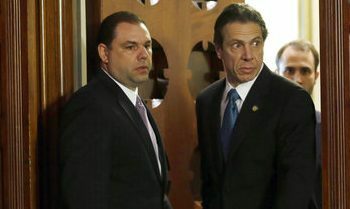 The trial also highlighted Percoco’s frequent use of state government offices while he was off the state payroll in 2014 and managing Cuomo’s re election campaign, a potential violation of state laws. Cuomo says he thought Percoco was doing “transitional work” in the office, and tying up loose ends from his old job, which Cuomo says is allowed. And he says if Percoco was doing more than that, then it was wrong. The governor’s political opponents scoffed at his explanation. State GOP Chair Ed Cox called it an “Oscar worthy performance” and says Cuomo condoned “illegal acts”. The governor told reporters that there was “absolutely no suggestion ever made that I had anything to with anything”. Cuomo called the critical comments “garbage” and part of the “political silly season”.